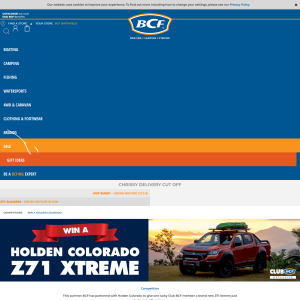 This summer BCF has partnered with Holden Colorado to give one lucky Club BCF member a brand new Z71 Xtreme just in time for Christmas. entering, entrants accept these conditions. are 18 years and over (Individual Entrants). concludes on Sunday 16th December 2018 at 23:59 AEDT. http://www.bcf.com.au, on the BCF Facebook page, on television, and via email. (1) entry into the draw. Purchase is registered by BCF and recorded against the relevant BCF member card. e. any failure by BCF to forward any entry to the draw location. The Promoter has no control over communications networks. the winner will forfeit the prize in whole and no substitute will be offered. of entry will in each case be the time the data is received by the Promoter’s database. section of The Australian newspaper on Thursday 10th January 2019.
within 40 days of the winner’s details being provided. possible, but specific requests to transport it will incur costs to the winner. aware that the winner and/or the winner’s entry is of a type described in this clause. they consent to the Promoter using their names and images in promotional material. 23. Prizes are not transferable, exchangeable or redeemable for cash or other products. and companies will not be liable for any damage or delay in transit to the prize. 27. The Promoter may communicate or advertise this competition using Facebook. in each state and territory, if required. to take any action that may be available. goods and services exchanged are of equal GST inclusive market values. of this information will be made without prior consent. Lawnton Queensland 4501. Phone number: (07) 3482 7800.